‪#‎India‬ Exposed: ‪#‎PakArmy‬ releases images of Unmanned Aerial Vehicles (UAVs) & ‪#‎Drones‬ violating airspace. Of late, a sudden spike both in terms of intensity, caliber escalation and air space violations by India has been observed along LOC and working boundary. Since 9 June 2015, 35 x Ceasefire violations have been committed by Indian troops. India is exhibiting aggressive posturing through enhanced movement of troops, extensive reconnaissance, targeting of civilians and increased use of Unmanned Aerial Vehicles (UAVs) and Drones violating airspace of Pakistan. One such drone (Quadcopter) mission was flown on 15 July 2015 by India in which it intruded from Indian Occupied Kashmir(IOK) Jaurian Sector and was flying over Own Banchirian Sector (near Bhimber), when was shot down by Pakistani troops. The Indian authorities denied Pakistan's claim that "it had shot down an Indian spy drone", whereas, photos & videos recovered from the internal memory of quadcopter provides irrefutable evidence that it was flown by Indian Army for reconnaissance inside Pakistan side of LOC. Some of the images and video clips are being released which clearly prove that quadcopter started its flight from an Indian post and entered into Pakistani territory. An image retrieved out of quadcopter proves that after the purchase of this quadcopter it was taken inside M/S ASCOM office (An Indian communication and Electronic Firm). Another pre-flight picture indicates presence of an Indian soldier (can be identified from Indian uniform) standing in the vicinity of quadcopter. An image probably taken before test flight of quadcopter on its arrival in forward areas indicate company headquarters of the Indian Sector. An image taken by quadcopter immediately after flight from a post shows an Indian flag which proves that it started its flight from Indian post. Another picture gives full aerial view of the Indian Post. Another still picture gives full view Indian side of LOC. Visuals retrieved indicate that quadcopter flew from Indian post (Indian flag visible). Initially it remained close to LOC, kept surveilling throughout facing towards Pakistani side of LOC, then crossed over LOC and pictured a Pakistani post (Pakistani flag marginally visible). Irrefutable Forensic evidence obtained from quadcopter now available with the Pakistan Army also gives out geographical histogram about locations traversed by quadcopter between 8 to 15 July 2015 and these can be verified by any independent sources. An image taken by quadcopter immediately after flight from a post shows an Indian flag which proves that it started its flight from Indian post. MUZAFFARABAD: The veteran Kashmiri leader, former President and Prime Minster of Azad Jammu and Kashmir Sardar Muhammad Abdul Qayyume Khan who passed away of protracted illness on Friday, was buried with full official protocol in his ancestral graveyard at Ghazi Abad, District Bagh of Azad Kashmir here on Saturday in the presence of a large number of mourners. 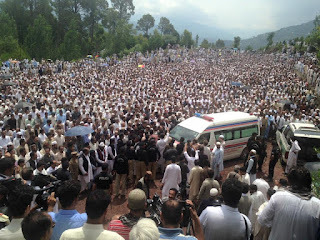 Thousands of people from all walks of life across Azad Kashmir and Islamabad including the heads of various political, religious parties and people from all walks of life attended the funeral ceremony of the late "Mujahid-e-Awwal" at Ghazi Abad. Prominent among those who participated in the funeral were included AJK Acting AJK President Sardar Ghulam Sadiq Khan, Federal Minster for Railways Khawaja Saad Rafique, PML (N) AJK Chief Raja Farooq Haider Khan, Cabinet Ministers and Members of Azad Jammu and Kashmir legislative Assembly. 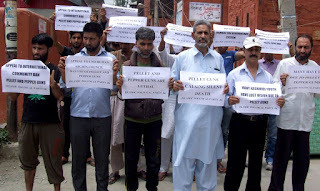 They paid glowing tribute to prominent Kashmiri leader who devoted his life for the cause of Kashmir cause and the rights of downtrodden people in the state. He remained steadfast and committed to his ideals and ideology throughout his life. The void created by his death will be difficult to fill, people said. Sardar Muhammad Abdul Qayoom khan passed away at Islamabad yesterday after protracted illness. It was a close holiday on Saturday in Azad Jammu and Kashmir. AJK Government has declared three day mourning over the death of former President and state flag is flying half-mast on public buildings. Talking to our correspondent people from different walks of life said that country is deprived of a great political leader. They said that Sardar Qayyum's contributions for strengthening democracy and liberation movement of Kashmir would always be remembered. Sardar Qayyum remained state President, Prime Minister and chairman of Kashmir Committee and was among the founders of Kashmiris' struggle for freedom. He was considered as one of the founders of the Kashmir Liberation Movement and the supreme leader of the Muslim Conference which is the oldest political party in Azad Jammu and Kashmir region. Sardar Qayyum was also known as Mujahid-e-Awal or the first warrior and was believed to have fired the first bullet in the 1947 war of liberation to establish AJK. 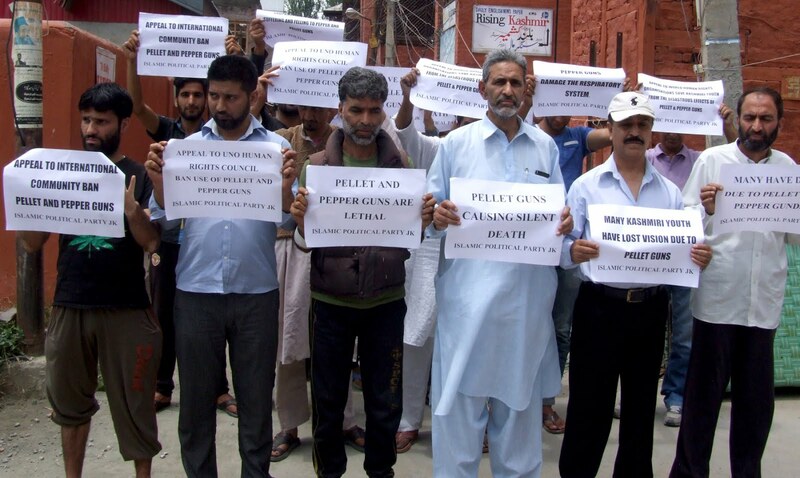 Islamic Political Party, today hold a silent protest at Press Colony Srinagar against the use of lethal Pellet and Peeper Gas.